The shape of a delta is influenced by sediment input, wave energy, and tidal energy. 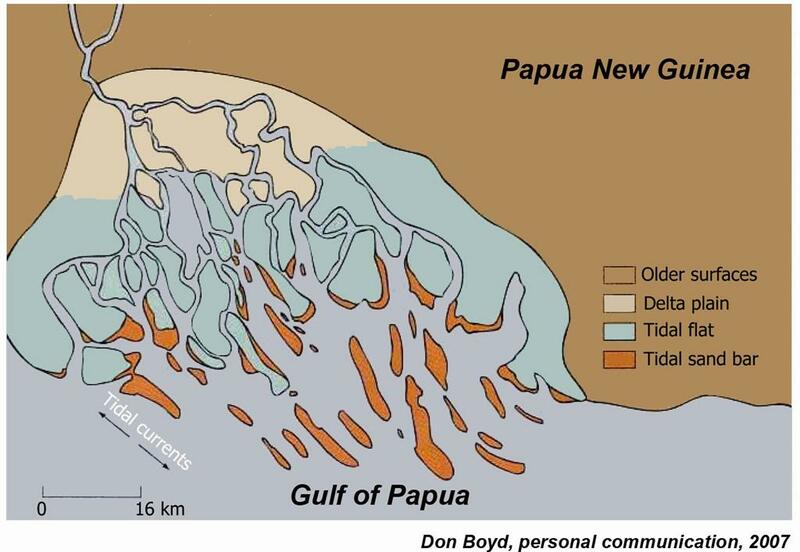 Deltas which undergo strong tidal interaction are classified as tide-dominated deltas. As sediment travels out of the delta into the sea, high tides and flood tides confine sediment on the delta plain and low tides carry sediment seaward. Tide-dominated deltas typically occur in locations of large tidal ranges or high tidal current speeds. In situations such as these, where the sediment supply is over powered by strong tidal currents, the delta tends to be very small. Another resulting feature of a tide-dominated delta is that it has many linear structures parallel to the tidal flow and perpendicular to the shore (shown below). These tidal sand ridges are characteristic of the subaqueous delta plain. They may reach relief heights of up to 15-20 meters close to the shoreline. Relief of the ridges decrease with increasing distances from the distributaries. Ridges are also greater in relief and size when there is more tidal discharge than fluvial discharge. Sediments that make up the sand ridges are fine to medium sands. Characteristic of the lower delta plain are broad tidal flats that grade unidirectionally into the sand bars and the opposite direction into marshes or evaporative flats (depending on climate). The delta has a gradational, upward coarsening sequence of muds; interbedded sands, silts, and muds; and then fine to medium sands. Due to the eroding effect of tides, the sands display cross-bedding, the sand ridge field can be truncated through erosion, and the distributary channel sediments contain more slack-water mud drapes than usual.